File Integrity Monitoring | Qualys, Inc.
Log and track file changes across global IT systems. Deploying FIM via a cloud-based security and compliance platform allows enterprises to easily scale these efforts and take advantage of a consolidated security solution to achieve compliance on a global scale, while reducing the high costs of multiple point products. 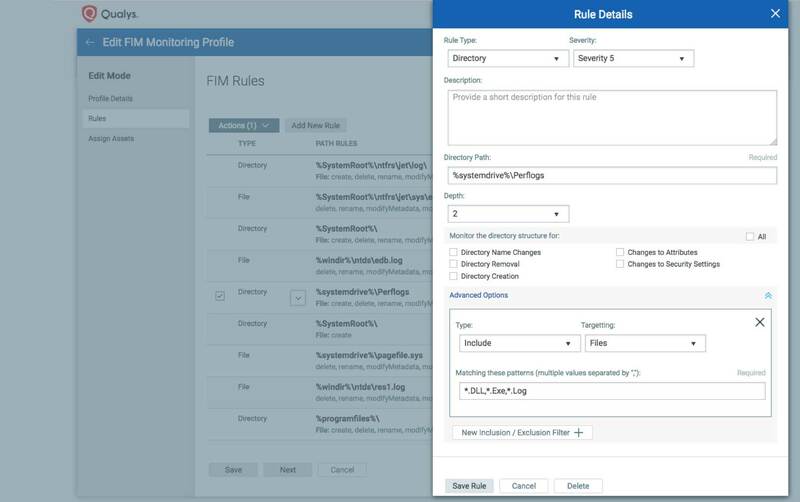 Deciding what to monitor is a challenge for most security teams, so FIM comes with out-of-the-box profiles based on industry best practices and vendor-recommended guidelines for common compliance and audit requirements, including PCI mandates. The Qualys Cloud Agent continuously monitors the files and directories specified in the monitoring profile and captures critical data to identify what changed along with environment details such as which user and process was involved. It sends data to the Qualys Cloud Platform for analysis and reporting, whether the systems are on premises, in the cloud, or remote. FIM can be instantly activated on existing agents, monitoring for changes locally with minimal impact to the endpoint. Qualys Cloud Platform allows you to scale to the largest environments, without having to purchase expensive server software, hardware and storage. Performance impact on the endpoint is minimized by efficiently monitoring for file changes locally using a real-time detection driver and sending the data to the Qualys Cloud Platform. That’s where all the heavy work of analysis and correlation occur. The Qualys Cloud Agent is self-updating and self-healing, keeping itself up to date with no need to reboot. The Qualys Cloud Agent provides unified security capabilities for Qualys FIM, Qualys Indication of Compromise, Qualys Vulnerability Management, Qualys Policy Compliance and Qualys Asset Inventory within a single agent and console, regardless of the size of the environment. 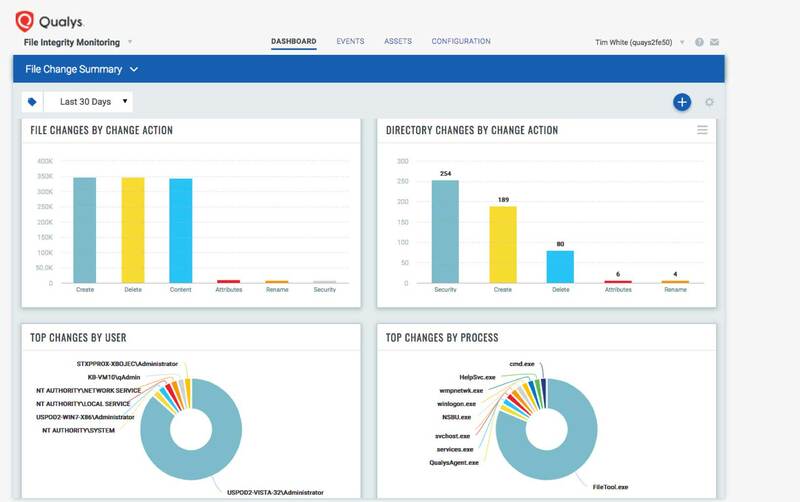 Security analysts can make use of dynamic dashboards, interactive and saved searches, and visual widgets in Qualys’ unified dashboard to monitor changes. The powerful search engine allows you to find related changes quickly, which can be invaluable when responding to a breach or enforcing change control policies. 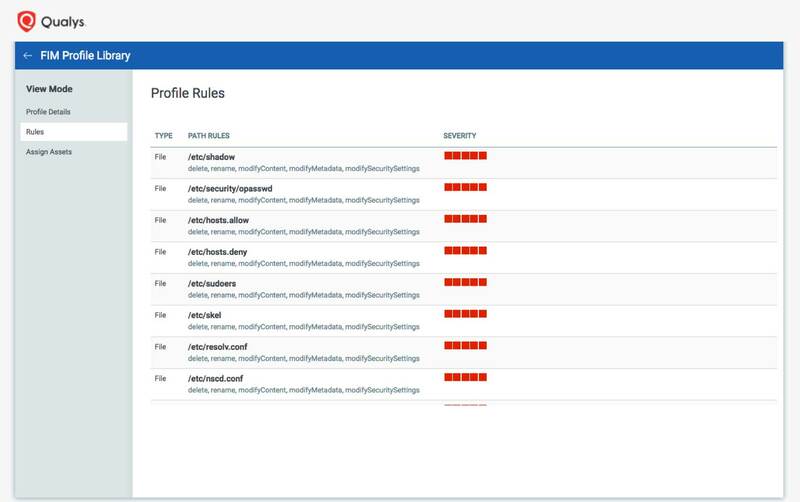 From Qualys FIM’s single console, you monitor critical assets for changes across diverse cloud and on-premises environments of all sizes, including the largest ones. This is made possible by a unique combination of Qualys Cloud Agent technology, broad platform support, unparalleled scalability, and a powerful but easy to configure real-time monitoring engine. Built on the Qualys Cloud Platform, FIM gives you robust scalability, performance and centralized management, while removing the need to purchase expensive servers and software to manage an on premises solution. This allows you to focus on event review and response. Is shared by other Qualys apps for collecting other security and compliance data, as well as file data for indication of compromise, vulnerabilities, configuration details and inventory information. Additional platform support coming soon for other Linux platforms. Whether you need file integrity monitoring for PCI, change control enforcement, or another regulatory requirement, Qualys FIM is designed to be easy to configure, offering you maximum flexibility to tailor its capabilities to your organization’s specific needs. 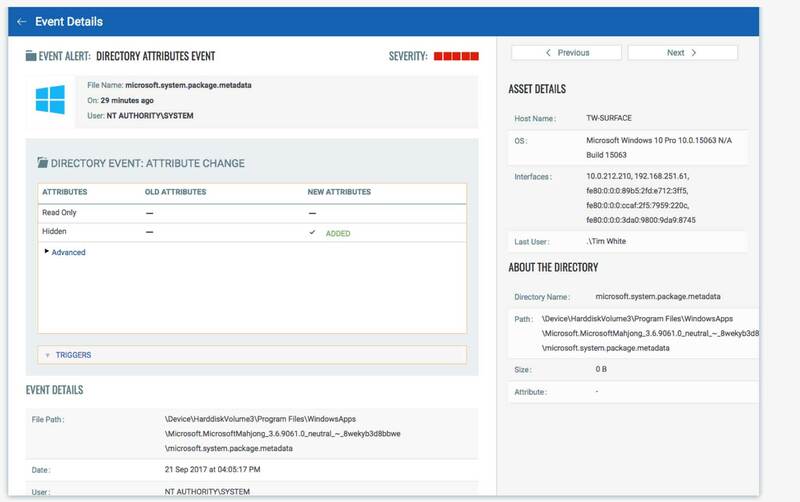 You can get started quickly with out-of-the-box monitoring profiles, pre-configured and tuned to monitor critical operating system binaries, configuration files, and other files critical to the security of the operating system. The rules are tested and calibrated by Qualys for accuracy and to reduce alert “noise”. Find related events quickly and track statistics across your entire environment to classify internal changes, identify malicious activity, and provide crucial information during response. Powerful dashboards provide flexible customizable views to fit a variety of change management and compliance needs. ​Qualys FIM logs and centrally tracks file change events across your global IT systems, making it easier than ever to investigate changes to assets, and discover if they are due to normal events or malicious activity. Mine all event data via a powerful search engine that lets you submit complex queries with multiple criteria and find similar events quickly across a single device or your entire IT infrastructure. This allows you to detect and identify critical changes, incidents and audit risks. Visualize data via interactive, customizable widgets, charts and graphs in the dynamic dashboard, providing complete and instant visibility of file integrity statistics. Drill down to details on events, assets, users and trends, and zero in on potentially damaging changes. Share findings by exporting events and generating custom reports tailored for different teams, such as security incident response and IT operations.